So what became of the Trinitron, which Susumu Yoshida, Akio Ohgoshi, Senri Miyaoka and other engineers under Ibuka's supervision (see Part I, Chapter 15) had worked so hard to develop? Five years had passed since the first Trinitron color television (KV-1310), was launched in Japan in October 1968. Overseas demand had grown steadily and Sony had built manufacturing plants for color TVs and cathode ray tubes (CRTs). As Sony was preparing to establish a new plant overseas, wonderful news came. Sony's Trinitron was selected for an Emmy Award. The Emmy Award is to the TV industry what the Academy Award is to the motion picture industry--the highest of all honors. The award is presented by the National Academy of Television Arts and Sciences to acknowledge television's best programs, actors, producers and TV stations as well as ground-breaking technology for broadcast hardware systems. The Trinitron was the world's first TV receiver to be awarded an Emmy. At the award ceremony broadcast nationwide in the US, Ibuka received the golden Emmy with a feeling of great joy and nervousness at the realization of the award's importance. Since then, and for more than 20 years, Trinitron technology-represented by a single-gun, three-beam aperture grille and a cylindrical flat panel-continues to maintain a leading technological edge. As a core Sony technology, Trinitron sustains the company's growth in AV industries worldwide. The Trinitron was first introduced with a 13 inch screen, and the product line has since expanded to include both larger and smaller models. This reflects technological advances and the incorporation of such new design concepts as "Profeel" and "Profeel Pro," making Trinitron one of the most popular home-use televisions. Furthermore, thanks to its CRT technology, Trinitron's ultra high-resolution and bright screen gave birth to a new business that goes beyond the original applications for the home. The next great leap for Trinitron was triggered by the rapid increase in the popularity of computers during the 1980s. Sony undertook CRT development with computer displays toward the end of the 1970s. At that time, there were market indicators that computers and CAD/CAM would become popular. Sony began receiving inquiries for Trinitron CRTs from computer manufacturers. There were even cases where such customers took the liberty of removing Trinitron CRTs from the television sets to install them in their computer displays because computer displays require high-resolution and brightness, to display small characters and fonts. Such needs naturally drew attention to the superior resolution of the Trinitron. Sony eventually decided to begin full-scale development efforts to design a computer display utilizing Trinitron's strengths. The aim was to develop a computer display CRT to enable clear presentation of characters and graphics even in the screen's corners. Computer displays require a resolution level ten times greater than conventional TV screens, since computer displays process a large volume of information at high speed. The effort of Sony engineers was rewarded with the development of the Graphic Display Monitor (GDM) in 1983. This monitor had high-resolution and high-density display qualities ideal for CAD/CAM and computer graphics applications. Sony's sales team aggressively promoted the GDM to manufacturers of workstations, rapidly establishing an excellent reputation for Trinitron computer displays. Reflecting the explosive growth of the workstation market from the latter half of the 1980s, OEM sales of the GDM to computer manufacturers increased drastically. Trinitron displays became the choice for workstations. The increased use of PCs within educational institutions eventually led to the development of the CPD series, a line of lower priced and smaller screen sized products. Sales of this new line of computer displays and the existing GDM series began to take off by the end of the 1980s. In the early 1990s, Sony established its own sales and distribution channels and launched a Sony brand display business to compliment its steadily growing OEM business. Since then, the computer display business has been enjoying rapid expansion. In June 1994, a quarter of a century after the first Trinitron CRT was developed, the cumulative worldwide output of Trinitron CRTs exceeded 100 million units. The second half of this quantity was manufactured in only the last five years. The emergence of large screen, high-resolution TVs and the continuing growth in computer display demand reinforced the excellent reputation of Trinitron. Demand for Trinitron CRTs spread beyond home-use to applications in the broadcast and computer industries. This rapid increase in demand was met while Sony continued its policy of manufacturing close to its markets. 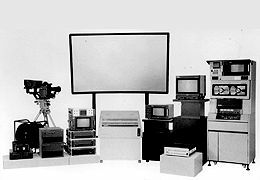 Following construction of color TV plants, Sony built CRT production sites in Japan, the US, Europe and Asia. With the completion of the Singapore CRT plant in 1992, Sony could ship CRTs for color TVs from all four regions. In the United States, where demand for computer displays is extremely high, Sony set up a comprehensive production line in 1995. By the beginning of 1995, Sony had become the world's number one supplier of color televisions. The popularity of PCs for home-use had by then increased drastically, resulting in further growth in the computer display market. Meanwhile, the broadcast environment changed radically, as satellite and high definition transmissions became widespread in some markets. Sony introduced a new home-use television in Japan in October 1995. Known as "PowerWide," this TV is capable of displaying three different sources simultaneously, including high definition television, and of serving as a PC display. The "PowerWide" TV is a wide-screen, 16 by 9 ratio monitor for the emerging multimedia age. The Trinitron CRT made it possible for the "PowerWide" product to display high definition images even in the corner of the screen. As user demands call for even higher resolution displays, Trinitron technology continues to evolve. 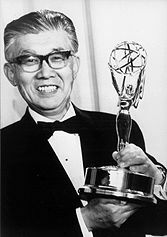 When thinking about Trinitron's contributions over the years, Morita often said, "The Trinitron is the most important asset after the 'S*O*N*Y' brand name."